I forget if I created an exception early on in Random iTunes Weekends that disallowed instrumental tracks. I vaguely remember instituting, or at least considering, such a rule. But if I did, I’m rescinding it now, not because this track from Brad Paisley’s largely instrumental album, Play, is particularly special, but because I don’t see any reason why songs with vocals should be deemed more legitimate than those without. Perhaps the most impressive fact about Brad Paisley’s instrumental album, Play, is that it didn’t break his streak of #1 records. Play didn’t wind up going Gold or Platinum like the rest of his albums but it did top the country charts. Most likely that is due to the album’s handful of vocal tracks, including today’s SOTD, a duet with Keith Urban. ‘Start a Band’ became Paisley’s ninth consecutive #1 single and his 13th overall. 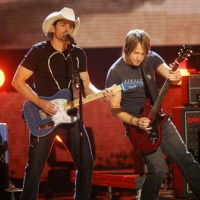 In keeping with Play‘s focus on the guitar, the song paired Paisley up with Urban, another country star known for his axe skills. 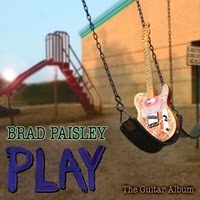 Brad Paisley’s sixth album, 2008’s Play, is a predominantly instrumental record. Eleven of its 16 tracks are music-only, showcasing the guitar chops that were overshadowed on his early records. In an NPR interview recorded after the release of Mud On the Tires, Paisley lamented that he wasn’t known as a guitar player first and a country music singer second. The instrument is his first love and his playing is the aspect of his music in which he takes the most pride. To this day, his dream is to share a stage with Eric Clapton. In that interview, Paisley announced his intention to one day record an instrumental album, and presumably the success of Mud On the Tires and its two smash follow-ups gave him the clout to do just that.